What do you get when you combine narcotics and deforestation? 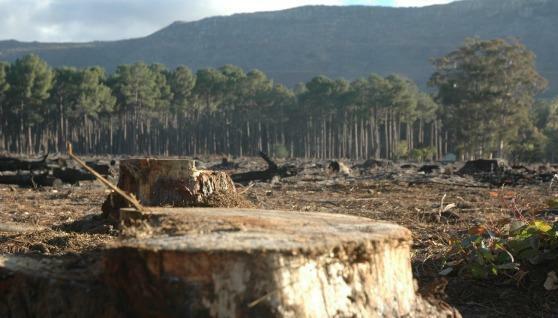 Destruction and the newly coined term narco-deforestation. This newly coined termed is being used to describe the destruction of sensitive forest ecosystems in Central and South America and is being called a greater threat than the age old concerns of legal logging and development. Narco-deforestation describes the destruction done by drug traffickers carving out new car routes and airplane strips for increased access to and through the jungles of the countries in Central and South America. These new routes make transport easier for this booming illegal trade, but spell increased destruction for the already fragile ecosystems. This new word as well as the destruction it describes is detailed in Kendra McSweeney's book Drug Policy as Conservation Policy: Narco-Deforestation, where she states that the protected ecosystems in these regions have become a hub for cocaine and other drug trades. A frequent example in her book is the Río Plátano Biosphere Reserve, a Unesco world heritage site in Honduras which has recently been destroyed. The narco-deforestation in the region was preceded by illegal logging; however both are playing a devastating role in the destruction of the rainforest's biodiversity. McSweeney states that, "20 percent of the total volume removed from tropical forests, but only a third is exported. This logging activity is documented and legal; imagine the consequences of illegal logging activities." McSweeney's book explains this destruction as part of what she calls the "Cockroach Effect." The cockroach effect explains that Mexico has always been a bit of a central area for drug trafficking, but because the authorities have begun cracking down, it has been pushed further south. Like the cockroach, if driven away from its home, its survival instincts will find a new one. Alas, Guatemala, Nicaragua and Honduras have been particularly targeted by the cockroach effect. What is worse it that as these drug traffickers move and set up shop elsewhere, they reinvest their drug money in other destructive practices such as cattle ranches and palm oil plants that continues to destroy.